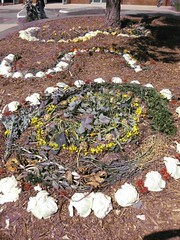 350 made of veggies at Coburg Civic Centre, in the township of Moreland (the near north suburbs of Melbourne, Australia.) The white leaves are cabbage. It is a shame there were no rooftops to climb on to get a good angle on it and alas, Melbourne is flat and this district is pretty urban, so no green hillsides either. I gave a little schpiel on plarn at this do. (Search blog for plarn if you don’t know what that is.) Beyond Zero Emissions gave a very nice schpiel. Australia is a huge exporter of coal so there are a large number of anti-greens because they think of all the $$$ they will lose in the short run. But think about it! Australia uses only a tiny percentage of its own coal. It’s not about them, it’s about their CUSTOMERS! Many of their biggest coal customers are making great strides to reduce THEIR carbon, ergo use other fuels and reduce their coal. Australia would do better to anticipate this and come up with some alternate plan. Copyright © 2009 Dork Chow. All Rights Reserved.